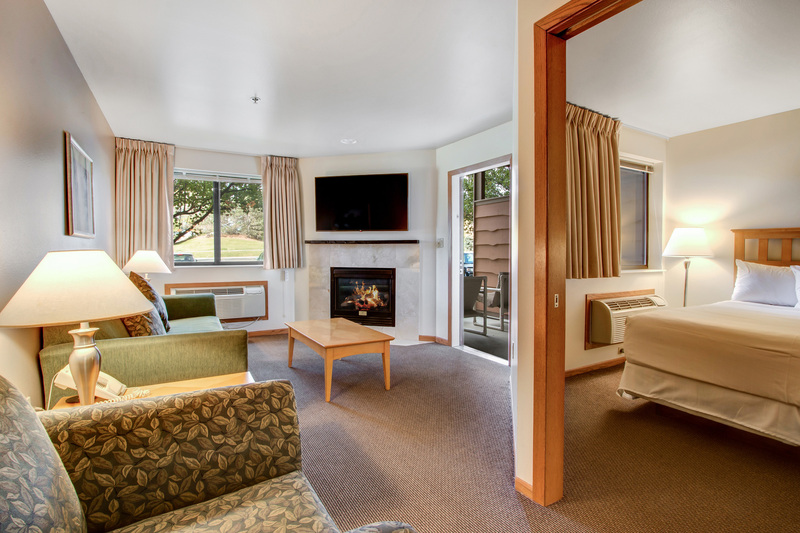 Timber Ridge's two-bedroom suites accommodate six people and provide guests with six waterpark admissions. Up to four additional passes can be purchased for $30 per night per person plus tax, restrictions apply over spring break periods and during holiday time periods. First floor layout includes living room with fireplace, two flat screen televisions, private master bedroom with Queen size bed, dining room, kitchen and bathroom complete with whirlpool bath or roll-in shower. The living room couch is a queen sofa sleeper, converting easily into a bed. 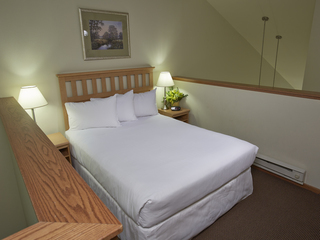 The second floor with its 48" guardrail overlooks the first floor and includes lofted bedroom with Queen bed, flat screen television and private bathroom. Each suite comes with a covered balcony off of the living rooms. 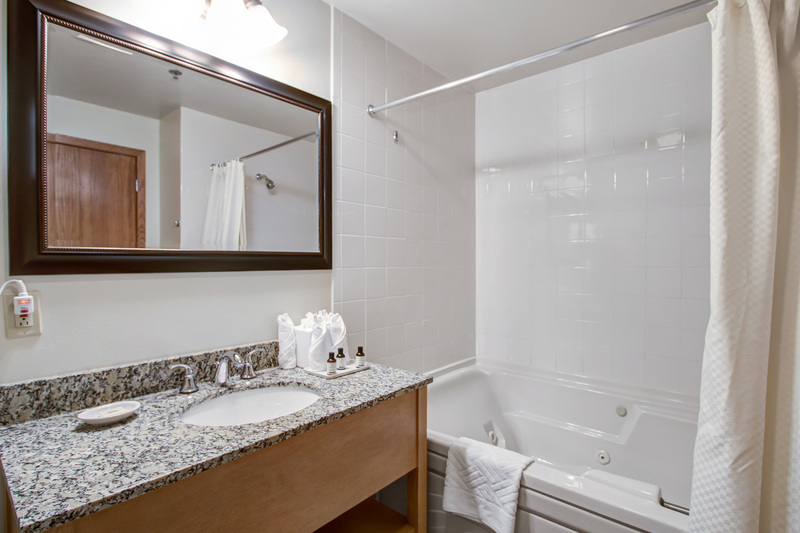 Accessible two-bedroom suites include elevated toilets, grab bars, convenient light switches as well as handheld/adjustable shower heads. Shower chairs and shower transfer benches are available upon request. All rates exclude a daily resort fee of $25.00 plus tax. 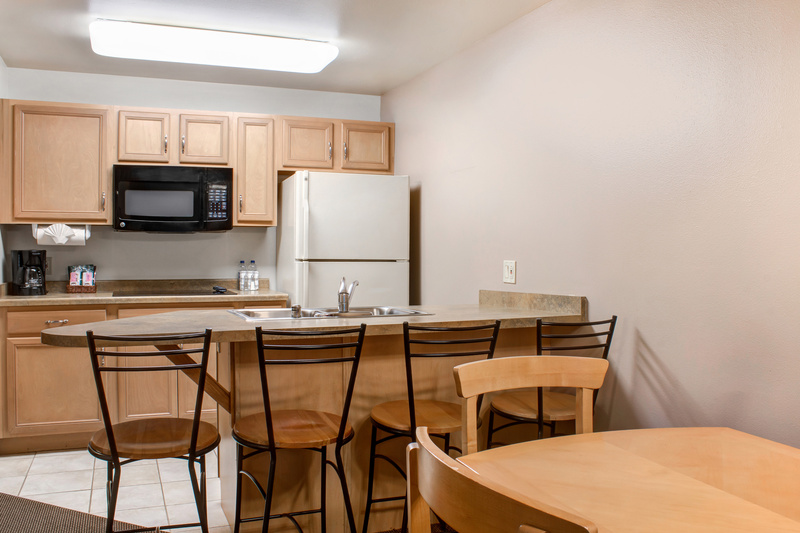 A one-night room/package, resort fee & tax deposit is due upon reservation. This deposit will be charged to the credit card provided upon booking. All rates exclude a daily resort fee of $25.00 plus tax. A valid Credit Card is required to confirm your reservation and one night room, tax, and resort fee will be charged at the time of reservation. Your new best friend is waiting for you! 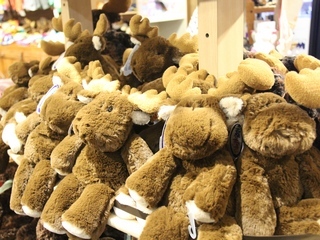 Upon arrival, your child will get to choose from several different moose stuffed animals to join the family adventure. Then when it is finally time to call it a day from the waterpark, the kids can look forward to sleeping with their new moose pal. 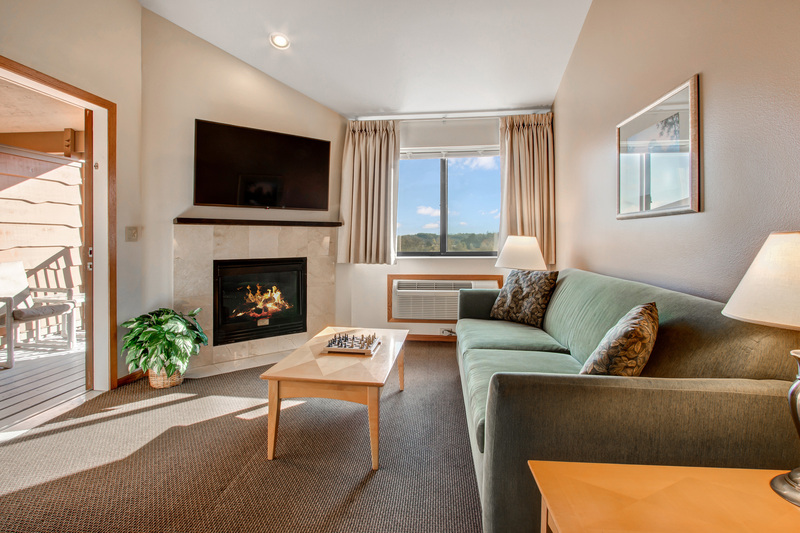 Package includes suite accommodations, four waterpark passes for a one bedroom suite or 6 passes for a two bedroom suite and 2 moose stuffed animals for a one bedroom suite and 4 moose stuffed animals for a two bedroom suite. All rates exclude a daily resort fee of $25.00 plus tax. Zippity Doo Dah - Soar through the trees on 8 different zip lines, 5 sky bridges, 3 spiral stairways and a one-of-a-kind “floating” double helix stairway. 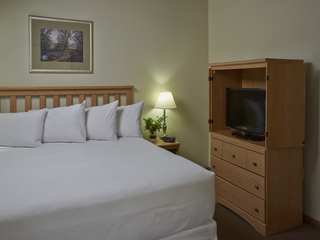 Then relax after your adventure at Grand Geneva Resort & Spa. 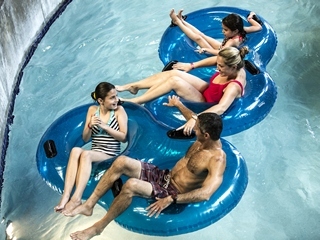 -	One night suite accommodations -	Four waterpark passes for a one-bedroom suite (six passes for a two-bedroom suite -	Includes a 2 ½ hour guided Zip Line Tour for two adults and two children at Lake Geneva Canopy Tours for a one bedroom suite (two adults and four children included with a two bedroom suite) Package is subject to availability. Valid until October 31, 2017. Package does not include nightly resort fee and taxes. Not valid with any other packages, discounts or special promotions. 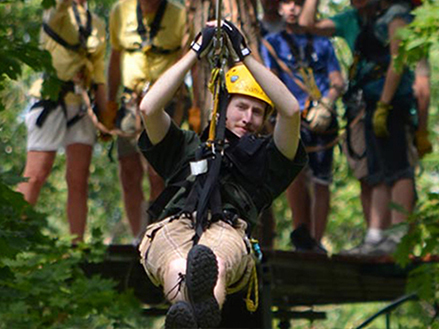 Zip Line reservations are recommended at time of booking as reservations do fill up quickly. Zip line participants are required to weigh 65 – 250 lbs. for the Zip Line Canopy Tour. This is strictly enforced; all participants will be weighed in at check-in. Participants should be 7 years old and up for the High Ropes Excursion and the Zip Line Canopy Tour. Children under the age of 16 are to be accompanied by an adult (1 adult per 7 youth). All participants must sign a Waiver of Release (a parent or legal guardian must also sign for participants under the age of 18). All rates exclude a daily resort fee of $25.00 plus tax. Timber All Access - Have you ever wished to have a whole waterpark to yourself? Your wish has just come true at Timber Ridge. 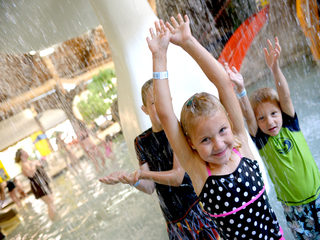 Enjoy a whole waterpark for only your family to enjoy with this all-access waterpark experience. -	One night suite accommodations -	Four waterpark passes for a one-bedroom suite (six passes for a two-bedroom suite) -	One hour of private waterpark time along with a personal lifeguard for your family (either pre-opening or after closing except Wednesday evenings or Saturday mornings) -	Reserved table for one day at the waterpark -	$50 dining credit for Hungry Moose Food Court or Smokey’s Bar-B-Que House Package is subject to availability. Valid until December 30, 2019. Not valid with any other packages, discounts or special promotions. Reservation must be booked at least 72 hours in advance. All rates exclude a daily resort fee of $25.00 plus tax. ©2015 The Marcus Corporation. All Rights Reserved.